Last year Dynacor significantly reduced costs of production. The company also started the dividend and share buyback programs. This year Dynacor wants to upgrade its processing plant from 300 tons of ore per day to 360 tons. I conservatively assume that this year the company will surpass its production guidance and deliver 102,000 ounces of gold. In my opinion, Dynacor shares are strongly undervalued now. As a result, they present a long-term buying opportunity. As discussed in my previous articles, Dynacor (OTCPK:DNGDF) has a pretty simple strategy. First of all, Peru is the world’s sixth-largest producer of gold (2017) but a big part of its production (21% in 2017) is attributable to the so-called artisanal and small-scale mining sector (ASM). ASM, apart from being a main source of income for the miners and their families, also is responsible for environmental pollution. To solve this problem, the Peruvian government tries to “civilize” this business. The proposal is simple: Go legal and process your gold ore at modern facilities built by the professionals. Dynacor is such a company. In 2017 Dynacor put online the Veta Dorada modern gold processing facility in the Arequipa region in Peru (the third largest gold camp in this country). Compared to its previous plant, Metalex in the Huanca region, Veta Dorada has a higher capacity and a convenient geographical location. However, the profitability of Veta Dorada (and other processing facilities) strongly depends on gold prices and costs of production. For example, in 2018 Dynacor was producing its gold dore bars at an all-in sustaining cost of production of $1,179 per ounce. At the average price of gold of $1,262 per ounce, the company made $121 on each ounce sold to its strategic partner (a Swiss refiner called PX Precinox). 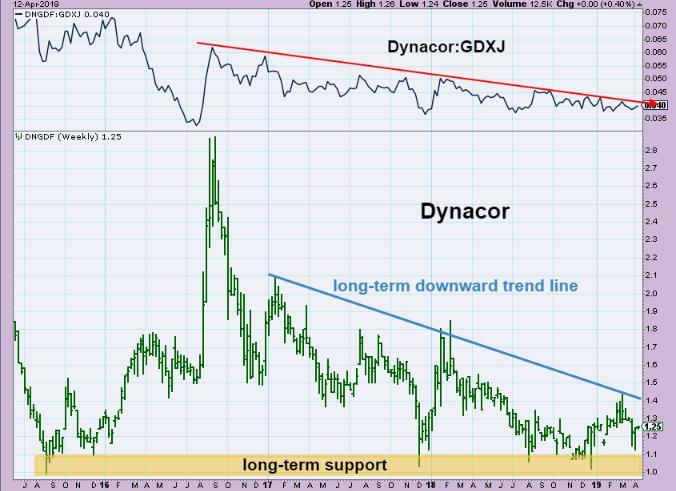 Well, compared to classic gold miners making approximately $303 on each ounce of gold sold (Kinross in 2018), the margin reported by Dynacor was pretty thin. So, where's the Dynacor’s edge over classic miners? The answer is pretty simple – Dynacor is not vulnerable to the classic mining risks as daily mining operations, construction and development of a mine, etc. In other words, the company is less risky than a classic gold miner. Now, assuming a free cash flow of $16.7M a year, one share of Dynacor is worth $4.56 and its floor value, assuming an annual dividend of $0.03 a share, is $0.60. Today these shares are trading at $1.26 a share so upside potential is extremely high. On the other hand, a floor price is approximately 50% below the current price. Note: To calculate the share value I am very conservative, using a high discount rate of 10%. I think that Peru deserves a lower discount rate (e.g. 7% - 8%) so my calculation seems to be underestimated. To calculate the floor value, I am using a discount factor of 5%, which seems to be appropriate for the de-risked financial inflows as dividends. Below I discuss the main features of Dynacor’s business. For example, costs of ore processed are a major cost item for Dynacor. As the panel on the right shows, the company was able to reduce this cost from $964 per ounce of gold equivalent in 1Q 2018 to $868 in 4Q 2018 (a decrease of 10.0%). Another example – an all-in sustaining cost of production (AISC) went down to one of the lowest levels in modern history ($1,136 per ounce in 4Q 2018 – the panel on the left). By the way, the company does not report a classic AISC so I had to make a few basic calculations to arrive at this cost. Note: AISC is defined as: revenue less cash flow from operations (excluding working capital items) plus CAPEX related to Veta Dorada (I have excluded the exploration capital spending from this calculation). Now, both charts show that costs of production are quite volatile at Dynacor. As a result, costs demonstrate a risk factor when considering the investment in Dynacor shares. However, the Veta Dorada plant has been operating at full steam since the beginning of 2017 so I assume that the company had enough time to learn and optimize it. It means that there's a good chance that the costs will be kept steady or even go lower, going forward. Ore always is a risk factor. Dynacor purchases its ore from the Peruvian artisanal miners. According to the company, there are currently 150,000 small-scale miners in this country. Additionally, very soon this number should grow by additional 15,000 (currently in the formalization process). It means that the ore supply seems to be secured in the long term. To develop its own gold project and use it as a source of ore – well, I hope Dynacor will not do it. Why? Simply put, it would add a few, big risk factors to the current profile, making the company much more complicated. By the way, Dynacor has an exploration property called Tumipampa (discussed below) but as far as I understand the matter, this project is still at an early stage of development and…to be honest, I would like to see Dynacor selling it. To increase a capacity of the mill - this is exactly what Dynacor wants to do. Simply, higher capacity can mitigate the ore grade problem. If the company is able to significantly increase a processing rate, it can produce more gold using lower-grade ore. Now, according to the company, this year it plans to increase the Veta Dorada capacity to 360 tons of ore per day (currently the mill is able to process no more than 300 tons per day). As discussed in the section “Investment thesis,” the second option is the one I am betting on. There are companies operating gold processing plants in Peru: Inca One (OTCPK:INCAF), Peruvian Metals (OTC:DUVNF) or Montan Mining (OTC:SAIDF). Of these three companies, the only viable competitor is, in my opinion, Inca One. Similarly to Dynacor, Inca processes the oxide ore purchased from artisanal miners. What's more, Inca’s two processing plants, Chala and Kori, also are located in the Arequipa region in Peru. However, Inca processes the ore grading 17.7 grams of gold per ton of ore (4Q 2018), well below the grades reported by Dynacor (31 – 35 g/t). It looks like Dynacor has a competitive advantage over Inca One. First of all, Tumipampa can be a risk factor and a catalyst. To remind my readers, Tumipampa is a gold/copper project located in Peru and the only material exploration property for the company. Interestingly, it looks like Dynacor has a very ambitious plan to develop this property. For example, since 2010 it has invested as much as $13.2M in exploration programs at this deposit. However, despite huge capital spending, the company was not even able to establish the mineral resources for Tumipampa. Hence, Tumipampa seems to be a risk factor, consuming the company’s capital and time with no material effect up to now. On the other hand, Tumipampa also could be a catalyst. The deposit is located in the Apurimac district in Peru between the Las Bambas copper mine owned by MMG Ltd and Los Chancas mine operated by Southern Copper (NYSE:SCCO). Now, a number of exploration programs resulted in a large database which, together with the deposit itself, constitute a saleable product for any party interested in further development of Tumipampa. Interestingly, according to the 2018 annual report, the book value of the property is $18.0M. Well, I hardly believe that Tumipampa can be sold for that price but…you never know. The shares of Dynacor are primarily listed on the Toronto Stock Exchange. Unfortunately, this year’s average daily volume stands at 26.1 thousand shares, which makes Dynacor a pretty illiquid stock. Dynacor has not disclosed the capex needed to upgrade the Veta Dorada mill. However, keeping in mind that construction of this facility (from scratch) had cost $18.5M (the acquisition of mineral rights included), I do not think that the company will spend more than, say, $5M to upgrade it. In other words, the upgrading of the mill is within the reach of Dynacor (at the end of 2018 the company held cash of $13.9M and practically no debt). It looks like Dynacor has not performed any impairment tests as of the end of 2018. Hence, it cannot be ruled out that some non-financial assets may qualify for impairment charges going forward (particularly the Tumipampa project). However, all my value estimates were done using cash measures so any impairment charge would have no impact on the company’s valuation. I estimate that at the end of 2018 Dynacor held enough ore to operate for 4.8 days. Yes, it's a pretty low figure, but history teaches that in the past the ore stocks were never particularly high. Share buyback program – in April 2018 Dynacor announced the implementation of a share buyback program. The company intends to repurchase up to 1.98 million shares. As at the end of 2018 Dynacor had purchased 0.45 million shares at an average price of $1.25 a share. I expect the continuation of this program this year. It has to be noted that the previous two bottoms (August 2016 and November 2017) were established when the company was constructing and developing the Veta Dorada plant. Today Dynacor is a totally different company – it has a new plant, delivers strong free cash flow, pays a dividend and plans to increase gold production. As a result, in my opinion, a final price breakout above the long-term downward trend line is likely. In 4Q and 3Q 2018 Dynacor made big progress, cutting an all-in sustaining cost of production to $1,136 per ounce of gold. Additionally, last year the company started paying a regular dividend and initiated a share buyback program. Finally, this year Dynacor plans to increase production to 82 – 92 thousand ounces of gold or, according to my own estimates, to 102 thousand ounces. Now, although in the past I used to be a bit skeptical about Dynacor, these new factors put a new and optimistic perspective on the company. As a result, in my opinion, Dynacor shares present a buying opportunity now, with a target price of $4.56 a share. Disclosure: I am/we are long CEF, GDX, SAND, ARREF, KL, DNGDF. I wrote this article myself, and it expresses my own opinions. I am not receiving compensation for it (other than from Seeking Alpha). I have no business relationship with any company whose stock is mentioned in this article.